The vehicle impoundment provisions in Road Safety Act 1986 Part 6A are about to be overhauled. The original provisions were introduced by the Road Safety and Other Acts (Vehicle Impoundment and Other Amendments) Act 2005, with effect from 1 July 2006. The explanatory memorandum is here, and the second reading speech here. Last year the Brumby government passed the Road Safety Amendment (Hoon Driving) Act 2010. We discussed that here. The explanatory memorandum is available here; the second reading speech here; and the statement of compatibility here. Not to be outdone, the current government intends amending the amending act to make the new provisions even more punitive. The Road Safety Amendment (Hoon Driving and Other Matters) Bill 2011 will almost certainly pass both houses of Parliament and is apparently intended to commence on 1 July 2011. The second reading speech is available here, and the statement of compatibility here. After painstakingly amending the amending act, and then amending the principal act, I think I've nutted out the changes we should see at the end of this month. Based on that, we've been working on this aide mémoire or ready reckoner to help make sense of it all. Bear in mind it's just an aide, and no substitute for reading the legislation. There are many more, but you can read them for yourself. I think the new legislation still contains a great many uncertainties, and won't provide the clarity that police and courts would hope for. What is not clear is what happens when an accused person allegedly commits a new relevant offence and has some old relevant offences. Let's say the police stop Billy the Buck on 2 Jul 2011 and he's disqualified from driving, and was previously convicted of disqualified driving on 20 Jun 2011. Under the new provisions they can seize his car on the roadside for 30 days. 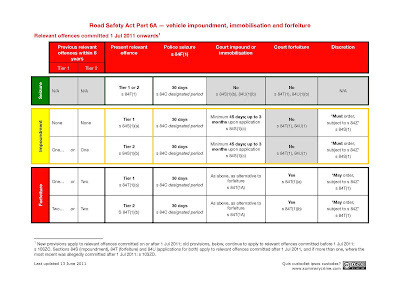 (1) Part 6A as amended by Part 2 of the Road Safety Amendment (Hoon Driving) Act 2010 applies to relevant offences alleged to have been committed on or after the commencement of Part 2 of that Act. In this example, the previous relevant offences were committed by Billy before the amending Act commenced. Sure, his present relevant offence is allegedly committed after that commencement, but because the transitional provision doesn't distinguish between previous and present relevant offences, it quite possibly refers to both. If so, it means the police have to wait for Billy to commit his second offence of driving when disqualified after 1 July before they can apply for impoundment after 1 July. After all the huffing and puffing and blow-your-house-down statements from the politicians, I reckon this is probably not the intention of the new legislation, but I think the ambiguity is arguable and will probably create another hydra of technicality. Tell us your thoughts about how these new provisions might operate. The way I read the Transitionals is that an offence committed before the 1st of July is a Tier 2. This can only be relevant if the most recent offence was committed after the 1st because if it was before it would not matter what Tier it is in. It would just be a relevant offence and the old system would apply? Alan, the s 103ZC(3) certainly provides that previous relevant offences are taken to be Tier 2 offences. In the example I gave, (the new) s 84E also comes into play, suggesting the new provisions might apply to drive while disqualified offences that occurred since the 2005 amendment commenced operation on 1 Jul 2006. But, s 84E(2) says that Tier 1 offences — such as drive while disqualified! — are a second or subsequent offence only if the first offence was committed on or after the commencement day. Presumably, this is meant to address the example I gave, but commencement day is defined to apply only in s 84E, rather than all of Part 6A, which creates some uncertainty. And of course, it doesn't address any other relevant offences such as dangerous driving or burn outs and donuts. My reading of that is that you would then be able to deduct 30 days (being the designated period) creating a 15 day mandatory period to 2 months. Interested in your thoughts.